As women go through menopause, it can often be challenging to know what is normal and when to talk to a doctor. Prolapse is a common condition many women deal with, but may be uncomfortable to discuss. 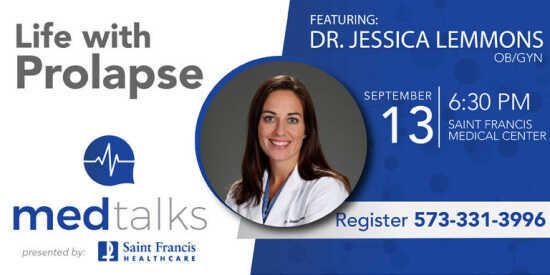 Join Dr. Jessica Lemmons as she shares new information about “Life with Prolapse,” including treatment options. To register online for this event, please visit www.sfmc.net/medtalks or call 573-331-3996. This event will take place in the Saint John of God Conference Room, located near Entrance 1.